It seems as if spring has finally sprung here. For today anyway. The ice is melting and great sheets are floating downstream past our house. The geese fly in every evening, land on the water, and then go for a stroll on the ice. You haven't seen (or heard) anything until you've seen a few hundred geese walk by your front yard on a sheet of ice. This morning there are only a few swimming in the river. But still, between the geese and the cardinals... it gets pretty noisy on the river this time of year. Spring break-up on the Rideau. So anyhoo... amidst the cacophony of bird noise, this morning I buckled down to do some serious work on my spring shopping preparations. Last month I posted about the research I'd been doing, looking for inspiration , and then choosing what struck my fancy. Then I foraged in my closet for anything that I might be able to haul out of storage and wear this year. Like my old blue Max Mara suit. I'm looking at spring coats in particular this year. Actually I look at spring coats every year. I just never find one I like, except on-line at a price point I am not willing to pay. Like these from Matches Fashion. I love a simple style like this. And I'd love to have a new coat in a colour, or pattern. But at $2300, $2800, and even $700 they're quite a bit more than I want to pay. Still, I do love a good shopping challenge. So a new coat is on my list again this year. 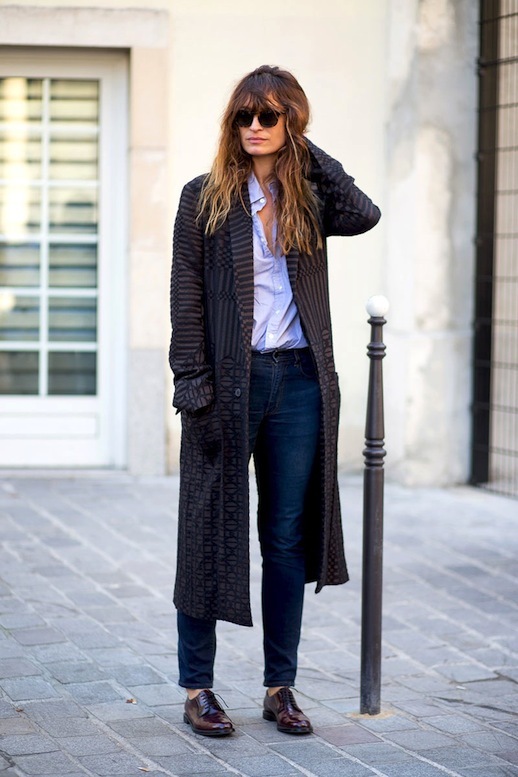 I also love this Frnch diamond print coat on Caroline de Maigret from the blog Le Fashion. This coat is not pricey and is available on-line... but I haven't been able to bring myself to do anymore on-line shopping since my Vince experience last year. Way too much trouble, too many hidden expenses when the store doesn't have a warehouse in Canada. And my two experiences with courier deliveries to my home have been a disaster. Especially the last one where the delivery company called me and insisted that the driver had left the package on my doorstep. Okay... so someone has a free package of Bobbi Brown day cream... but it's not me! And this after waiting a week to get the darned thing. But never mind. I'm just not planning to order on-line again... until I've calmed down. Except from Gap which does have a Canadian warehouse and ships with Canada Post. Much easier. But let's get back to spring shopping. I've done my research. Made my lists of what I have that I'll wear again this year. I keep track of all my wardrobe in my little book. So when I'm shopping I don't buy what I already have, and I can check to see what jacket, or pants I might wear with something that has struck my fancy. I also list the items I think I will sell this year. And those I will store for a few years because they are still good, and still fit, but I'm tired of them or they aren't current this season. You know those pieces that are in good shape, but which just look, well, wrong this year. Too short, too fitted, too long... whatever. Like my old blue Max Mara suit, which I stored for years and hauled back out this year. And finally I list my 'needs and wants' for this season. If I don't do this I will no doubt forget what I need, and what I want. And once I'm in the stores... when I am assailed by all the colours, and styles, and... oohhhh look at that... I'll end up coming home without the things I actually needed to begin with. Fashion attention deficit... I think they call it. This year, my list is pretty short. I don't need jeans, or pants of any kind. Or blouses. Or jackets... I'm well "jacket-ed"... so to speak. But a new spring coat does top my list, not black, but in a soft colour or a pattern, maybe. And I'm looking for a dress. A dress (or even a skirt) that I can wear with a couple of my short jackets (one denim, one leather) and with flats or flat sandals. Kind of "boho" style maybe. And I'm going to try culottes.... try them. I'm not convinced they will look good on me. But I'm keeping an open mind. And I'm always on the lookout for loose light sweaters or tee shirts that can be worn with skinny jeans and not show middle-age middle. That's it. And now I just need to decide what I will wear on my spring shopping trip. Something springy, of course. And comfortable. And which can be taken off and put back on easily. So I opted for my silky, black Vince turtleneck, and these skinny, black, knit pants from Vince which I bought in Montreal in January but haven't worn yet. And my Theory spring anorak from a couple of years ago. I bought this jacket when I was looking for a spring coat, but couldn't find one. It's feather light and good for casual wear. I love it. And with my leggings and black patent Stuart Weitzman loafers... it's casual but still smart... I think. And the very cool thing about this jacket is that it's reversible. One side the grey camo. And the other, black. Camo on one side, black on the other. But I prefer the camo side. More suited for spring, especially since everything else I have on besides the scarf is black too. Including my new Mackage cross-body bag. I love this little bag. Okay, so I know it's not a very colourful outfit. Not yet. That's what spring shopping is all about. Finding some colour. See how beautiful it is today? Sunny and +9 ° C. Yah! But in the spirit of blogging honesty, I'm not actually going shopping today. That's booked for next week. Today, I'm blogging (d'uh), and then I'm helping Hubby fix the garden shed door.... as his #1 assistant, I hold a mean screwdriver. So I'll just go get out of my shopping outfit, set it aside for next week, and change into my sweats and my rubber boots. That's retirement folks. One moment a fashionista, the next I'm holding the screw driver and passing the drill bits. So, friends, you know what's on my spring shopping wish list. For now anyway. Things might change; it is a work in progress, after all. Now do tell... what's on your list for spring? Love this jacket! What a great piece. I am attempting to find more dresses, but it isn't easy. Requires much trying on time. They can't be ordered online...I have to try them on! You look great! Thanks, Pam. I don't know how people order on-line, without an idea of how the item fits. Considering the percentage of items that work in the dressing room in a store, I'd spend half my time shipping things back to the store. So funny your comments on fashionista one minute and DIY helper the next. I know that feeling so well including the clothing. I also find it very frustrating buying on line living in Canada as like you have found it set with difficulties. My friends in the UK seem to be able to buy on line with few difficulties. More worrying is the trend (certainly in the UK from what I hear no personal experience here obviously), to close high street shops as on line shopping is taking over. I just hope that doesn't happen here in Canada as living in a rural community its a struggle as it is. Shopping trips have to be organized affairs! I hope it doesn't happen here either. We're rural as well, and when stores ship with couriers it hasn't worked for me at all. Even when I've asked for a call, they just show up at my door. The last time Hubby and I were both home, and the company insisted that according to the driver's GPS he was at our house. We still don't know what happened, although we think he left our package at our neighbour's house who was away in Florida. I envy you your organizational abilities when it comes to clothing and clothing purchases! One question, though: how will your hair look if you have to take off and put back on that turtleneck top while shopping? A bad hair day, no matter what the cause, totally ruins my shopping mojo. Good question! My Vince turtleneck is so light that I can pull it over my head without doing too much damage. Plus I'll probably go to Nordstrom, where my friend Liz works, I troll the racks, we bring everything into the dressing room, and then I only have to take it off once. She does all the running. Ooo that yellow and pink coat is fun and different! Looking pretty as always, Susan. Thanks so much for sharing with Fun Fashion Friday & have a great weekend! Thanks, Dawn Lucy. I know... I love the yellow and pink one. Too pricey for me, though. I love your bag, BTW. And so far all I think I need is some new yoga clothes, which we just shopped for today! Thanks, Lisa. I love its chunkiness. Wish I loved Yoga as much as I love Yoga pants:) To wear for exercise, I mean. I hate that they've become street wear for so many women. Thanks, Patti. I love to look back and see just how many years I've been looking for a spring coat...unsuccessfully. Thanks for hosting the link-up! First, great shopping outfit! I really like the anorak! The spring coats are beautiful! I hope you'll find something you like! Thanks, Andrea. I love making lists. Served me well when I was still teaching. That ombre Jonathan Saunders coat could not be more perfect! Love the dark pattern mixing in your look for this time of year -- the dark hues are perfect for "melting ice" weather -- it's always my go-to in March too! Isn't it great? If I could find one similar at about 1/3 the price I'd be very happy. About all the black...I can't bring myself to go full-on spring colours when it's still so cold. Sorry, I'm rather late commenting. I like all of the coats although personally I probably wouldn't wear the pink and yellow one ...it made me think of icecream!! Strawberry and vanilla if you're wondering! :) I really like your jacket, especially as it's reversible. Very versatile ... Ever since I first read a post on how you plan your clothes shopping for the upcoming seasons, I've been so impressed! I'm trying hard to think like you do and look at what I have, research and compile a list. Also for the last few months Ive been practising the "shopping from your wardrobe" I've read so much about ...and actually enjoying it! At the moment I think all I really need for spring/summer is a pair of white jeans. I'm not finding it easy though. I've tried skinny, boyfriend and straight. Just can't seem to find a pair that fits as I'd like. ie like my usual jeans! But at least this way I won't end up with two pairs that are "just ok" and then I don't wear then very often. I've decided if they don't look great I won't buy them! I'm applying this to all my purshases now ....why haven't I always done this?? . By the way I do most of my shopping on the internet, using brands I like with good customer service.....and yes, I do spend a lot of time returning things but I love the choice it gives me. I also support local shops especially individual ones as I think it's important we don't loose them from our towns. Meant to say I really enjoyed your video on Instagram showing the river with the ice moving along it ...oh and the birds chattering!! Have a good week! Hope your back's improving. I love shopping my closet. Makes me feel like I've outsmarted the system. I hear you about the white jeans. Last year I shopped for months for new jeans... well, over the course of several months..not months of actual shopping, although it felt like that. You know, I think that trying things on in your home actually makes for fewer shopping mistakes because you don't have the salesperson commenting, or a friend waiting or other pressures. If it were easier here to take delivery from on-line shopping I might do more of it. But most companies seem to deliver using Fed Ex and their service for us has been dreadful. So much rigmarole in January for the jar of Bobbi Brown cream, that they were out of at the store, and the salesgirl said we'll just order it and they will deliver it to your door. Ha. Then I watched the updates on-line as it was shipped from Vancouver, east to Lachine Quebec, then west back to Ottawa, then supposedly "left on doorstep at 5:30" one Tuesday a week later. Then the calls to Nordstrom, and calls from Fed Ex all of which made me feel like I had done something wrong. We even went out the next morning after the "supposed" delivery and searched our property and the neighbour's (who was away in Florida) Every once in a while Hubby will say..."Wonder where in heck that delivery guy left that package?" Phew...talk about a long comment! Sunny here today too. But... brrr...really cold. That's a really nice look. And it's smart of you to assess your needs and wants before entering stores. Once inside, we tend to lose perspective and buy stuff we don't really need 'cause it's cute. So true. I've been drawn to things I already own, until I check my list. Thanks, Rachel. If you could see our shed... glamour does not come into the picture. haha.